December 12th, 2010 3:31 PM by Lehel S.
Mary Kay Ash, founder of Mary Kay Cosmetics and one of the most successful entrepreneurs of all time, once noted, "Everyone wants to be appreciated, so if you appreciate someone, don't keep it a secret." Those are important words to live by not just during the holidays, but any time of year. First, who do you most appreciate in life? And second, have you ever told them how much they mean to you? Whether the person or people you appreciate are part of your life now, or played a role in the past like a beloved teacher, coach, or friend, consider sending them a letter or email and letting them know how much they impacted you. 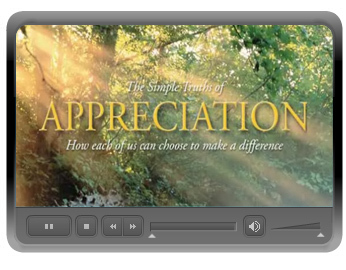 As you will see in the video from Simple Truths, your words can make all the difference. As you get ready to say hello to a brand new year, consider saying a few other things as well, like thank you to the people who have been there for you. 'Tis the season, after all.